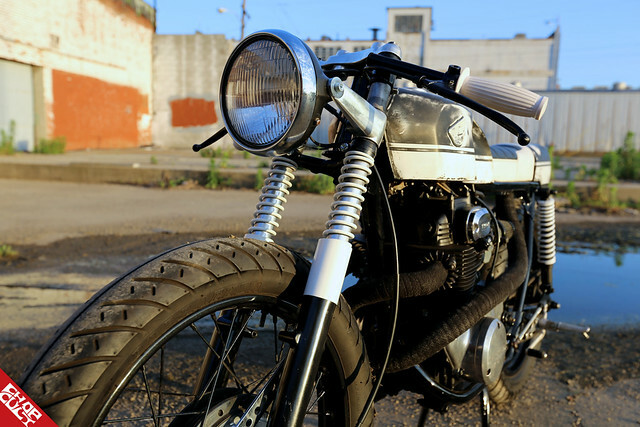 Retro Wrench’s first official shop build is the result of straight-up gonzo bike building. Customer and friend of Retro Wrench John Campbell was so consumed with riding his first motorbike that he refused to leave it in the garage even for one afternoon. In fact, he postponed servicing the CB350 until the old wiring literally caught fire. Even then, the guys at Retro Wrench nearly had to steal it from him. Thus began the piracy that spawned Issue One. The bike came to Retro Wrench in the same condition Campbell acquired it. The first project bike of another local rider, it had some issues that are to be expected with a first attempt at modification. Having finally conceded to electrical repairs, Campbell was quick to agree to a rebuild. While he had some ideas of his own about the look of the final product, he didn’t hesitate entrusting his bike to the shop for whatever modifications they deemed fit. Much like the difference between picking flash off the wall for a tattoo and letting a tattooist design a piece with one’s tastes in mind, Campbell had confidence he’d get the most fetch results when he granted the shop licentia poetica. Metal Sculptor Brad White removed an inch from the bottom of a stock 1969 CB350 tank and detailed it with streamlined knee cuts, a primary feature of the bike’s “lady parts.” The nutty crisscrossed pipes are the aftermath of heavily modified stock double wall exhaust wrapping around into a single hand built can. White’s raw, rattlecan black and white paint scheme is a nod to Xerox copied DIY punk rock/skate ‘zines, reminiscent of the many nights all the hands at Retro Wrench spent in Kinkos as teens. Combine the straightforward aesthetic with the confusingly simple hand-loomed, five-wire harness crafted by Retro Wrench’s James Kemp and Chad Francis and you get Issue One: the manifestation of old skaters, punk-rockers, and dirt riders occupying a warehouse and doing what they love—putting old bikes on the road. Retro Wrench admits Issue One is hateful to ride, but going to the bar was never so much fun. Now in just the fourth month at their shop, Retro Wrench has already been dubbed a destination shop by CheapCycleParts.com. 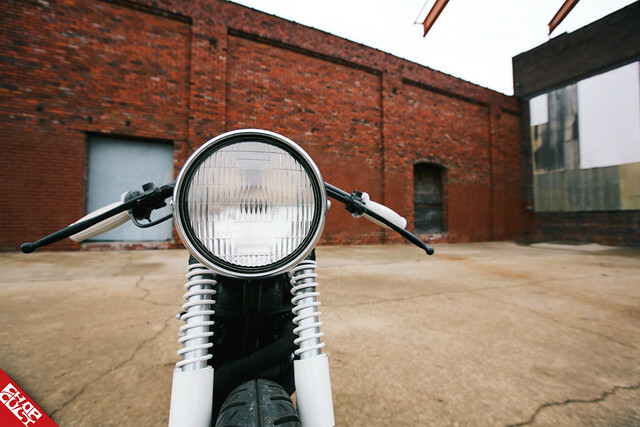 To any rider or wrencher, one glance through the unassuming bay door on the side of a hundred year-old paper mill in downtown Louisville sparks a sense of sanctuary. Both rare and familiar vintage and modern bikes fit to bust, vintage gas tanks hung at staggered lengths across a full wall like timeworn family photos, and unpretentiously displayed rows of exhaust pipes slung over rafters verify that motorcycles are the lifeblood of Retro Wrench and its associates. A full service shop with in-house design and fabrication services makes for an unimaginably righteous spot to envision and hash-out the fire, air, compression, and fashion of any vintage motorcycle. 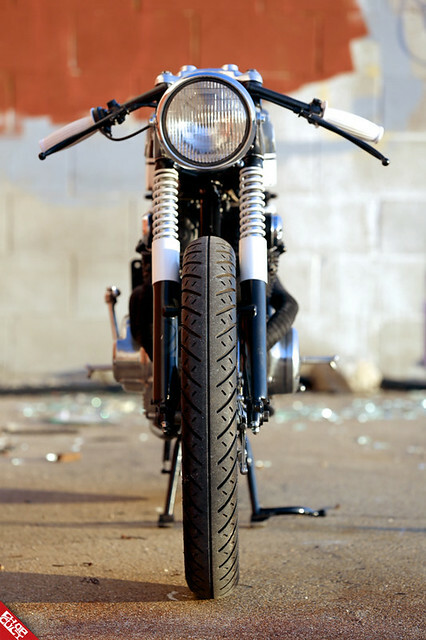 Plus, Retro Wrench is a licensed Biltwell dealer and offers tons of other motorcycle swag and parts. Like issue one, everything about Retro Wrench is black and white. These guys are the Fugazi of motorcycle maintenance. Even their “Ride Old Bikes” T-shirts only wear the shop name as an afterthought. This truly no-frills, no-budget, Kentucky-style grassroots shop is as straightforward as its name. Behind that garage door there is nothing but motorcycle business and all the mischief and magic that entails. No budget means affordable, reliable builds and repairs for all, but it also means most friends of the shop are at least part-time volunteers. All are welcome, but if you show up to hang out, don’t be surprised if you get put to work. Retro Wrench’s Chad Francis, Matt Brownee Westbrook, Brad White, Donny Greene, and James Kemp, (along with Campbell) are all members of two-wheel enthusiast group Louisville Vintage Motorworks. 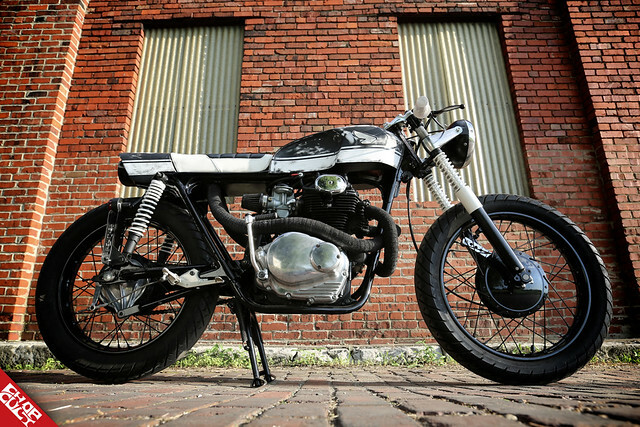 Owner name, location: John Campbell, Louisville, Ky.
Engine, year and make, model, modifications: 1970 Honda CB350 came into the shop as a hacked cafe build, the bike was taken to the ground and reworked. 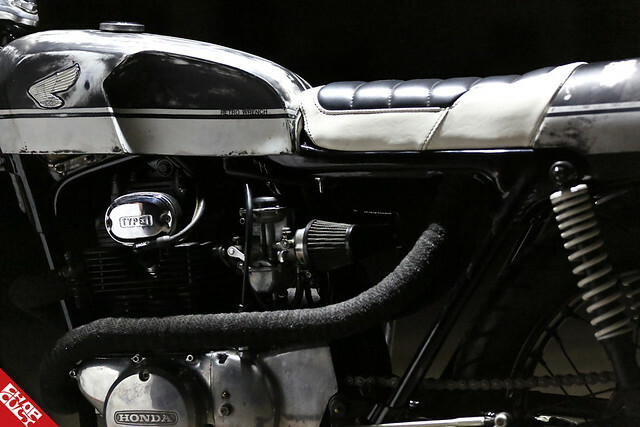 Metal Sculptor Brad White removed an inch from the bottom of a stock 1969 CB350 tank and detailed it with streamlined knee cuts, a primary feature of the bikes lady parts. The nutty crisscrossed pipes are the aftermath of heavily modified stock double wall exhaust wrapping around into a single hand built can. White raw, rattlecan black and white paint scheme is a nod to Xerox copied DIY punk rock/skate zines, reminiscent of the many nights all the hands at Retro Wrench spent in Kinkos as teens. Combine the straightforward aesthetic with the confusingly simple hand-loomed, five-wire harness crafted by Retro Wrenchs James Kemp and Chad Francis and you get Issue One: the manifestation of old skaters, punk-rockers, and dirt riders occupying a warehouse and doing what they love putting old bikes on the road. Retro Wrench admits Issue One is hateful to ride, but going to the bar was never so much fun. Ride Old Bikes. Frame: Stock frame shortened, shaved and modified for battery/electronics under seat. 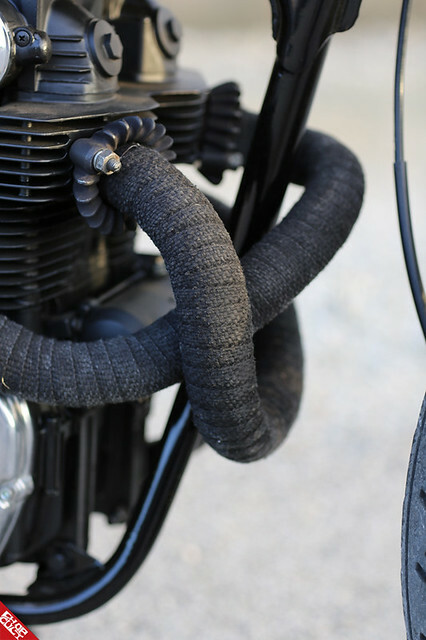 Other mods, accessories, cool parts, etc: Handbuilt exhaust system that crosses over itself in the front and exits under the handmade tailpiece. Big thanks to all that have supported us along the way. I like it. Has soul. a lot of bikes today lack a reason for a build other than to just produce some more crap to sell. this had a story and a purpose. Neat. This bike's story is great and it looks even better! I love the wacky pipes. That's cool! Hope to see so much more from these guys! Bike and story are cool! Post more pics of that pooch! About five minutes ago I coined the term "elegant rat" to describe a bike over at pipeburn..and what do ya know here's another one...Though WAY more "elegant"
than "rat".. but I think the my new term describes the esthetic here..
That thing is way cool!